Each year my list seems to require one album not yet available in the US. Hands was released this summer and was supposed to see a release here in the Fall, since moved to 2010. Mind you the album was actually recorded in LA, the first single raised ears in the trailer for the movie Jennifer's Body and it's the most radio-friendly thing on my mix. The hardest admission is that I preferred this album to the sophomore release of the comparable Annie (it was a really close call). 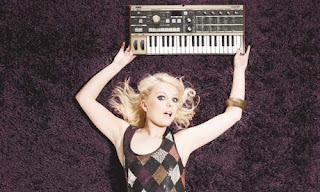 Little Boots is Victoria Hesketh, a former Pop Idol reject, and the girl is not afraid to release a mainstream pop album to the indie crowd. It doesn't when she endears herself to fans by doing stuff like covering 80s synthpop in her pajamas on YouTube. I believe this makes three years in a row for a Treasure Fingers remix at years end.